The invention of the Telephone in the 1870s showed that sound could be converted into electrical signals and back into sound again. The association between electricity and sound became stronger with the discovery of components which could create and manipulate those electrical signals. Electronics has completely revolutionised music production, from microphones and speakers to amplifiers, recording equipment, transmitters and receivers, and the development of electronic instruments. From early beginnings instrumental development split into a wide range of electric guitars, organs, pianos, drum machines and a host of electronic instruments with no real life counterpart. The possibilities have inspired many composers and musicians to experiment and to create. Electronic music has since expanded into a huge industry which nowadays touches virtually all recorded music in some shape or form. The 19th Century saw some initial experimentation in the design of electronic instruments with varying degress of success. It was in the 20th century when things began to accelerate. One of the first electronic instruments to make a lasting impression on the industry was the Theremin, initially called the "Thereminvox" invented by Leon Theremin (an anglicised version of his Russian name Lev Sergeivitich Termen) in 1917. This has no keyboard but translates hand movement near its two antenae into sounds, so the player might appear to be waving their hands or "conducting" the music. It is a difficult instrument to master but is capable of subtle musical expression. The inventor moved to the US in 1927 for a period before returning to Russia in 1938. His promotion of the instrument kept it in the public consciousness and its unusual sounds caught the attention of composers looking to exploit those qualities in their works, particularly during the 1950s when Science Fiction film music utilised its other-worldly atmospherics. Due to renewed interest in this type of instrument it is still manufactured and available to purchase - e.g. check out the Moog Etherwave Plus. 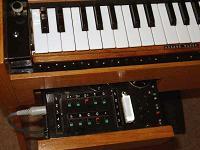 The Ondes Martenot was invented in 1928 by Maurice Martenot in France. This was basically a keyboard instrument but had a number of adaptations making it capable of some unusual effects such as vibrato, portamento, glissando and timbre controls. It caught the attention of some of the avant-garde classical composers of the day (including Olivier Messiaen for example) who used this instrument in some of their works. One of the foremost artists on the Ondes Martenot was the sister of its inventor, Ginette Martenot. Apart from Classical music, the Ondes Martenot still makes an occasional appearance in some pop music and Barry Gray used the instrument in some of his music for the Gerry Anderson puppet series such as Thunderbirds. Laurens Hammond developed his first Hammond Organ in 1935. Its low price allowed it to enter the mainstream, becoming a huge commercial success in the process with various versions of the instrument appearing in live music venues and in homes. The original Moog Synthesiser appeared in 1964 but it was a huge room-sized beast with great musical potential but limited to music studios by virtue of its size. 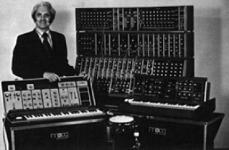 The inventor Robert Moog brought out the Mini Moog in 1970 which overcame those limitations. Since it was capable of a far richer variety of sounds than the electronic organs of the day yet still of comparable size, it became a big commercial and artistic success. The term "synthesiser" (to describe this type of musical instrument) came into general use around 1967. It consists of one or more generators (or oscillators) which create the basic signal, and then a variety of controls to modify that signal or add effects. Frequently (although not always) a keyboard is used to trigger the signal, and a variety of knobs and sliders used to configure the sound. The creative potential of electronic instruments has attracted a great number of composers, and those composers have exploited that potential in a large number of different ways. It's perhaps unsurprising that the group of composers known as experimentalists have sought to use electronics in weird and wonderful ways. Among composers to take this route are Karlheinz Stockhausen, John Cage and Steve Reich, and often their approach was to find novel uses for common pieces of electronic equipment such as microphones, speakers and tape recorders. Among the regular electronic instruments, the Ondes Martenot has come particularly close to acceptance as an instrument for the concert hall. Its invention in France saw its early adoption by composers such as Olivier Messiaen, Darius Milhaut and Pierre Boulez. Increasingly however, electronic instruments are used to create recorded rather than live music. Film Composers initially sought to use electronic instruments for their unusual sound effects, which would help to emphasise otherworldly experiences. The Theremin was a favourite instrument in this respect, and Theremin's fellow Russian composer Dmitri Shostakovich was one of the first to use the instrument for his film score to "Odna" (Alone) in 1931 and "Podrugi" (The Girlfriends) in 1936. Miklos Rozsa used a Theremin in his music for the dream sequence (designed by the surrealist artist Salvador Dali) in the Alfred Hitchcock film "Spellbound" in 1945, Dimitri Tiomkin used one on the original version of "The Thing" in 1951 and Bernard Herrmann used two Theremins on his soundtrack to The Day the Earth Stood Still also in 1951. The soundtrack to Forbidden Planet in 1956 was the first to consist entirely of electronic sounds, with the out of this world electronic effects created by Louis and Bebe Barron (a husband and wife team) using custom-built circuits and magnetic tape methods. 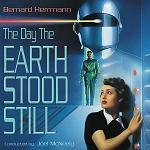 Herrmann also acted as a consultant when Oskar Sala and Remi Gassmann used a Mixtur-Trautonium (an enhanced version of an instrument called the Trautonium) to create the eerie sound effects for the Hitchcock thriller "The Birds" in 1963. Similarly in television, Delia Derbyshire manipulated recorded sounds and pieced them together to create the broadcast version of Ron Grainer's theme tune for Doctor Who in 1963. She was the youngest member of the BBC Radiophonic Workshop which went on to create music and sound effects for this series and many other television programmes. Another electronic pioneer who also composed regularly for Doctor Who was Tristram Cary. Electronic instruments and sounds have also been sought out by creative popular artists. 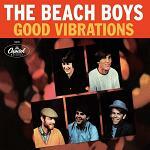 Brian Wilson of "The Beach Boys" used the unique sound of the Theremin on the band's appropriately named "Good Vibrations" single. The Beatles used a Mellotron on their "Strawberry Fields Forever" and a Moog synthesiser on the track "Because" on their Abbey Road album. Pink Floyd used the ubiquitous Moog synthesisers in a number of places as did Keith Emerson of "Emerson, Lake and Palmer" on their "Lucky Man" single. For the "Mysterons" track on their album "Dummy", the band Portishead simulated a Theremin-like sound and combined this with a sample taken from Barry Gray's music for the TV puppet series "Captain Scarlet and the Mysterons". Gary Numan frequently used synthesiser sounds, such as on "Cars", and other artists too numerous to mention have also followed a similar path. It wasn't long before a new breed of composers emerged who specialised in using electronic instruments almost exclusively. 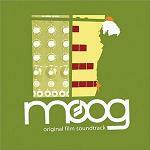 Wendy Carlos was among these early pioneers who showed what Moog Synthesisers were capable of. 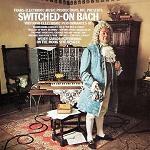 She produced the album "Switched On Bach" in 1969 which took Bach's music from the 18th century and gave it a 20th century spin and demonstrated the expressive potential of these instruments. Her discussions with Robert Moog about the instrument and its usability shaped the development of later versions of his synthesiser range. Carlos west on to create electronic versions of Beethoven's music in the film "A Clockwork Orange" for Stanley Kubrick in 1971. Following her lead the Japanese composer Isao Tomita also used Moog synthesisers and other electronic equipment to create superb realisations of well-known Classical works in a series of albums beginning in the 1970s, including "Snowflakes are Dancing" (1974) based on the piano music of Claude Debussy and "The Planets" (1977) based on Gustav Holst's "The Planet Suite". Rather than re-visiting existing classical music, other artists created their own original music solely for electronic instruments. 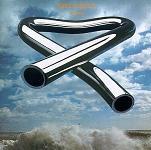 Mike Oldfield created his "Tubular Bells" (1973) whose title track was used on the film "The Exorcist". Jean Michel Jarre released a number of albums including "Oxygene" in 1976 and "Equinoxe" in 1978. The composer Vangelis also specialised in the creation of electronic music and released a number of albums throughout the 1970s and composed electronic soundtracks for the films "Chariots of Fire" (1981) and "BladeRunner" (1982). In Germany groups such as Kraftwerk and Tangerine Dream were taking electronic music in new and different directions. Artists including Rick Wakeman occasionally of Yes, Brian Eno initially of Roxy Music, and Enya initially of Clannad have also relied heavily on electronic sounds, and synthesisers were increasingly seen not as a specialist sound but as just another instrumental texture to add to the overall sound pallet. Electronic music has now largely moved from the analogue into the digital realm, and is frequently recorded onto hard disk (or CD) rather than magnetic tape or vinyl. Instead of creating sounds directly using electronic circuitry, the value of every "sample" of a sound can be rapidly calculated using the power of a desktop computer. This shift from hardware to software has given electronic music even greater freedom, and has further reduced production costs and enabled many more artists to participate in the revolution. Through the increasing use and manipulation of digital "samples", many software instruments can emulate orchestral instruments with increasing realism and indeed many of the pioneering synthesisers of Moog and other engineers have now been digitally recreated in software. Popular music has been exploiting electronic instruments for many years now, and many styles rely heavily on electronic instruments. Modern Dance Music has split into a bewildering variety of genres (including "Techno", "House", and "Trance" sometimes collectively called Electronica) and many tracks from these styles are built in software using virtual instruments, with electronic effects processing. 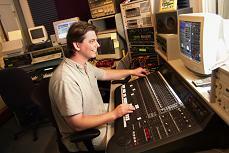 Every step from recording through to mixing and mastering is performed in the digital domain. Even the vocal line may be heavily processed electronically before the track is finalised. Sometimes this might be simply to enhance the vocals by removing any small imperfections, but at other times the voice may be altered to create an effect such as with a "vocoder". This kind of effect was also used by Wendy Carlos for the choral parts from Beethoven's 9th Symphony in "A Clockwork Orange". Similarly, Electronic Music is now frequently used to support the visual media, whether on its own or integrated with acoustic recordings. Many TV programmes, trailers and adverts rely heavily on electronically generated sounds for their impact. Even though the film industry can have higher budgets, it is subject to the same financial pressures and fashions as television. Recent soundtracks using synths and electronic include mainstream movies such as James Horner's Titanic, and many action and genre movies such as The Bourne Supremacy, The Matrix Reloaded, Tron: Legacy by Electronic duo "Daft Punk" and the latest Bond film Skyfall, many of whose scores consist of a fusion of electronics and orchestral sounds. One thing is certain - Electronic Music is here to stay and it will continue to evolve in new directions in the years to come. And here is a great find - a huge playlist on "ubuweb" featuring many historic examples of Electroacoustic Music (1937-2001) - Highly recommended: www.ubu.com/sound/electronic.html. This article would seem incomplete without some examples of electronic music, though for copyright reasons we have had to create these ourselves. Here are some works from the mfiles classical catalogue which have been played and recorded through a variety of software instruments. These have not had the same care and attention as others in the genre (by Carlos and Tomita for example), but the results illustrate the creative potential of these virtual instruments and celebrate the pivotal role played by those early pioneers. My exposure to Electronic Music was a gradual process. Although I must have seen several sci-fi movies and programmes on TV, the first electronic soundtrack to make an impression was "A Clockwork Orange" where I was particularly taken by the Beethoven arrangements. 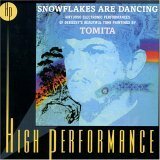 Later as a student I was introduced to the classical interpretations of Tomita and bought all his albums, though his album "The Planets" was withdrawn in the UK and I had to make do with a copy on casette tape. After that it was the film scores of Vangelis and the albums Jean Michel Jarre which made we wake up to the possibilities of electronic music. Later through rewatching on video and DVD, I came to appreciate the superb examples used in Doctor Who.